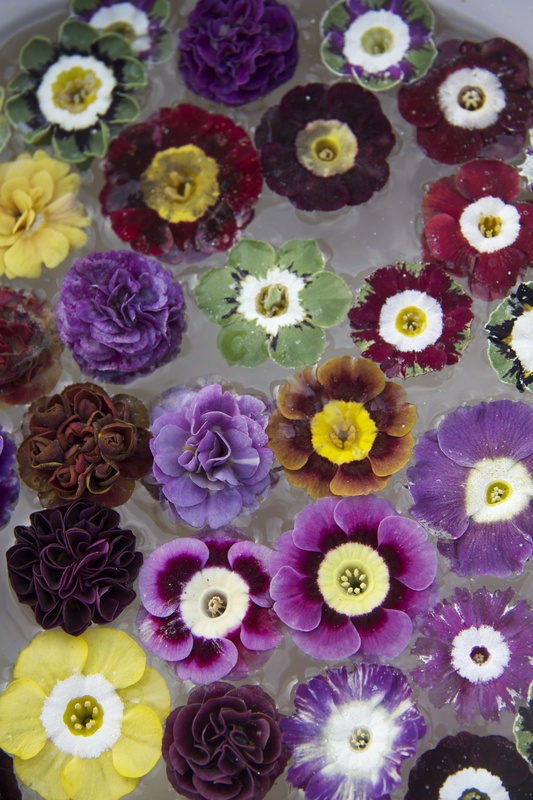 This gorgeous, spirit-lifting image is of a bowl of floating Auricula flowers at the entrance to a small ‘Alpine plant sales’ glasshouse at Ashwood Nurseries which I visited this week, (www.ashwoodnurseries.com). 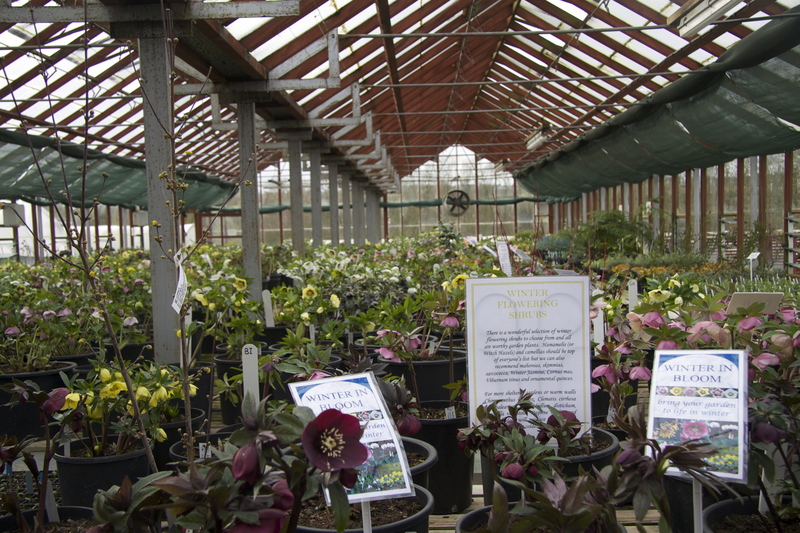 The nursery is completely worth a pilgrimage even if the round trip from home – London to Wolverhampton and back – is over 250 miles and even if the weather forecast during this wettest January on record is simply not be borne. 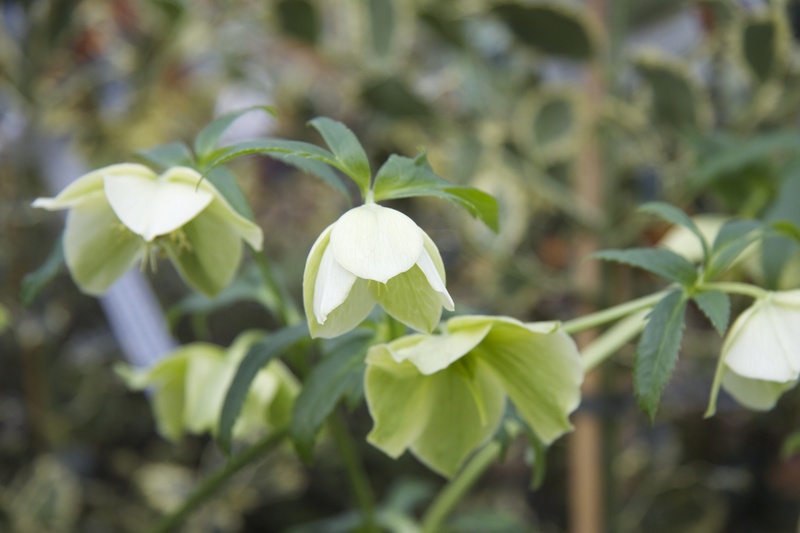 I will love to have the graceful, bobbing saucers of intoxicatingly scented pale green just outside my back door. 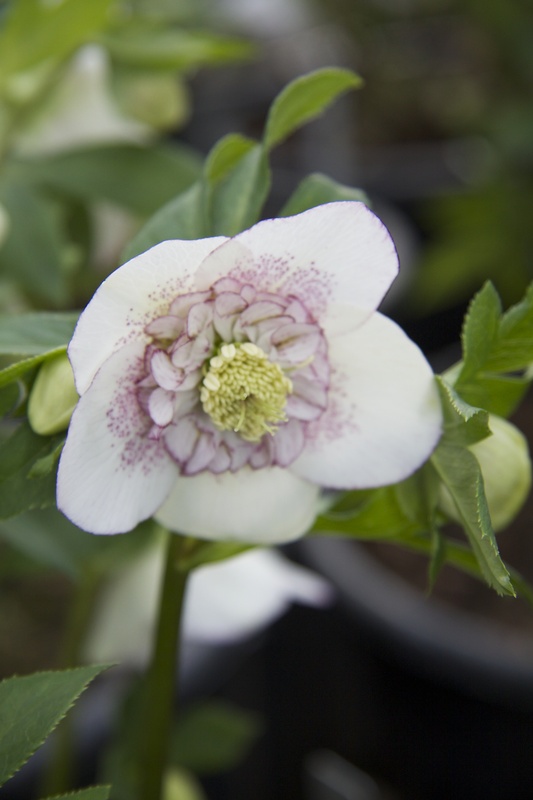 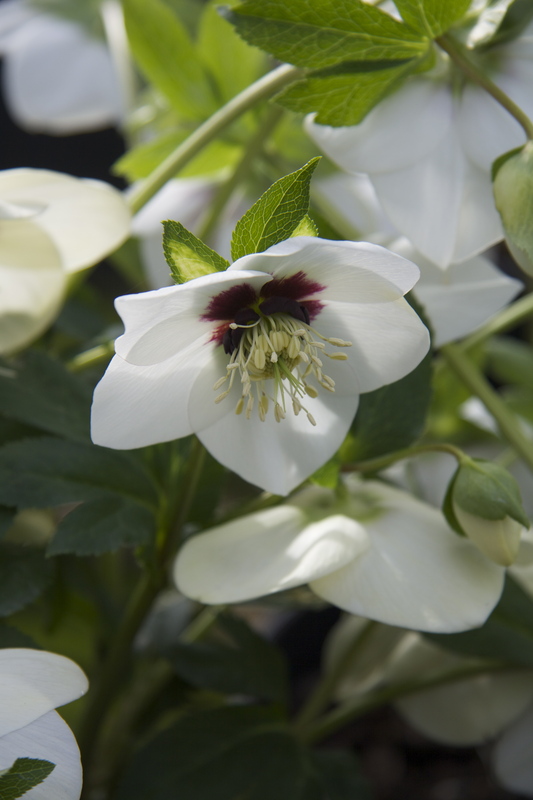 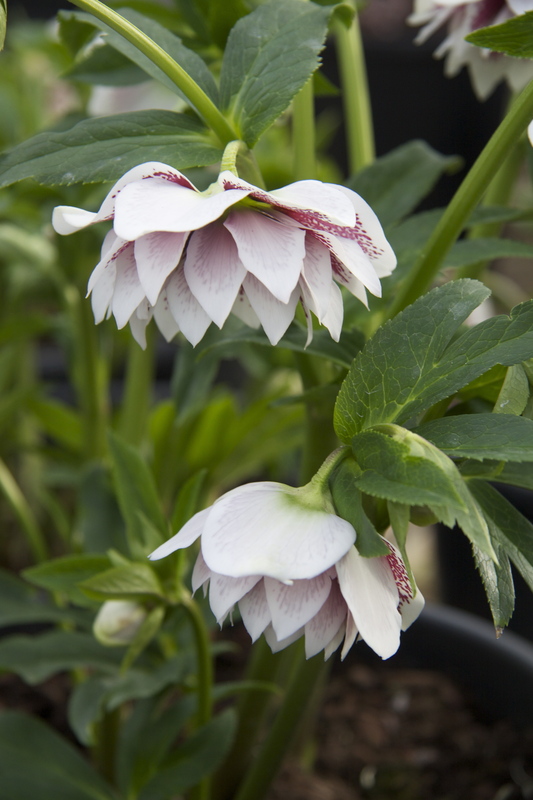 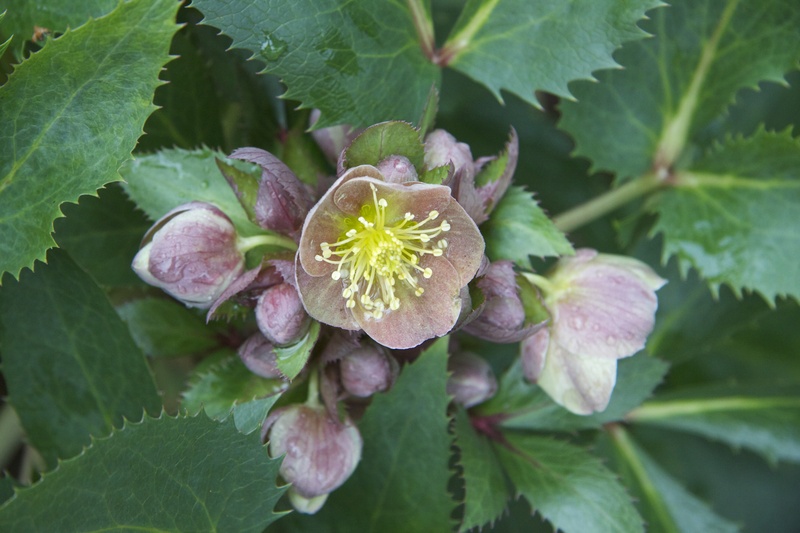 A few of the Ashwood hybrids have slightly extreme, decorative qualities which are perhaps for specialist collectors only but most of them are subtle and gorgeous, super-healthy plants which would be wonderful additions to soft and natural spring gardens. 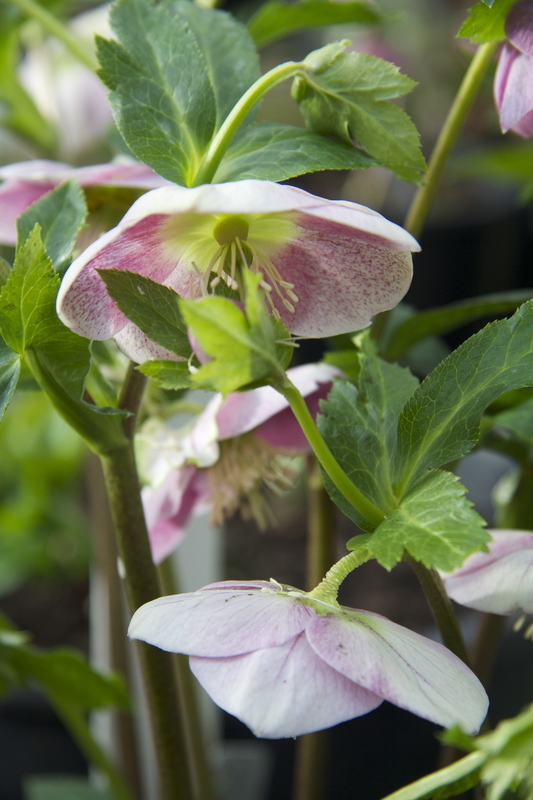 Dizzy with hellebores, we move onto Cyclamen. 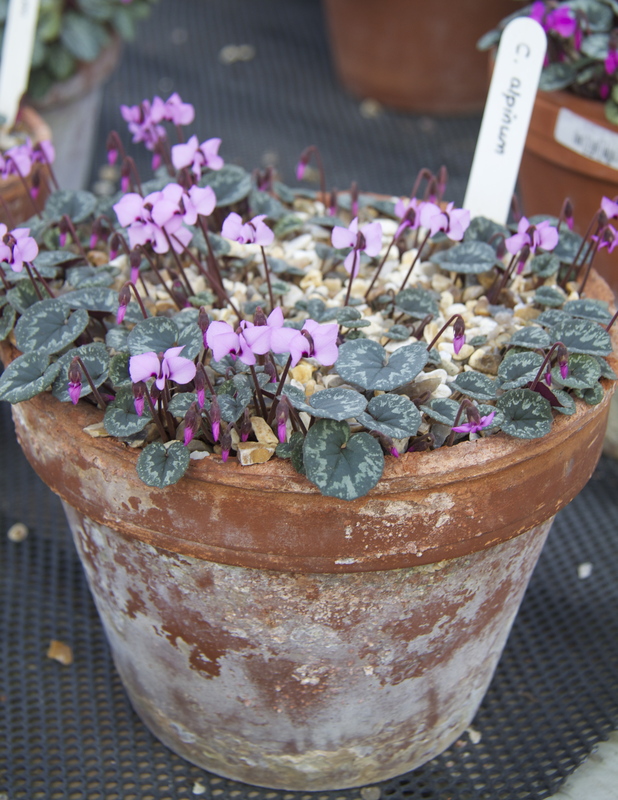 Phillip shows us fantastic fat pots of Cyclamen coum. 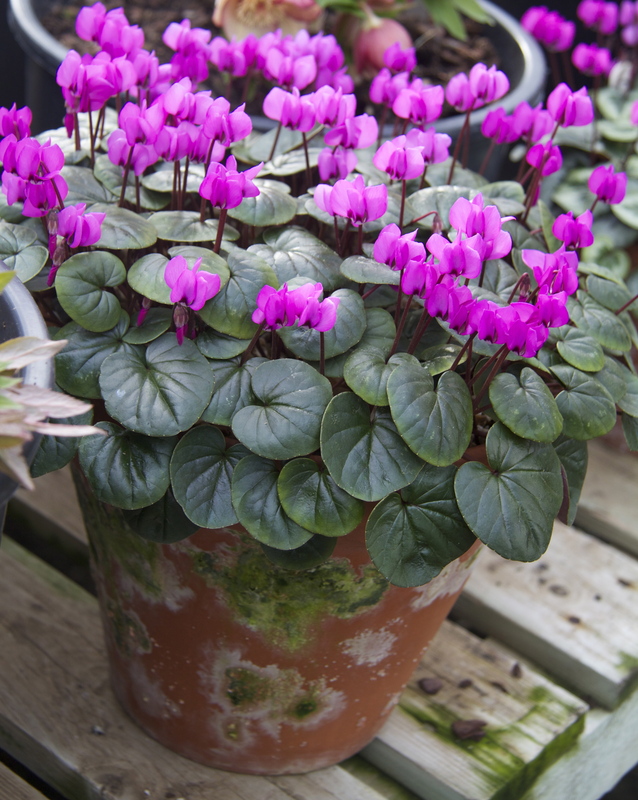 We are struck by the tremendous success of the seemingly simple idea of taking one 9cm pot of Cyclamen coum, potting it up with plenty of drainage “perlite rather than grit”, says Phillip, and just transferring it to a slightly larger pot each year. 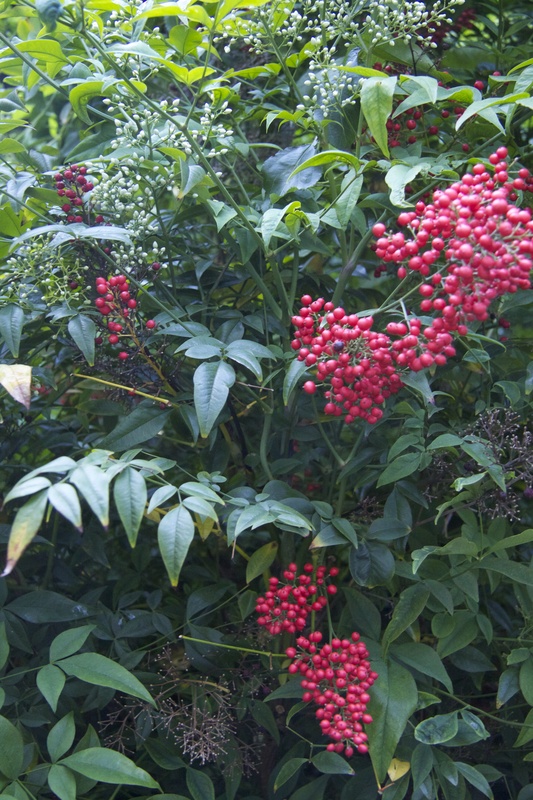 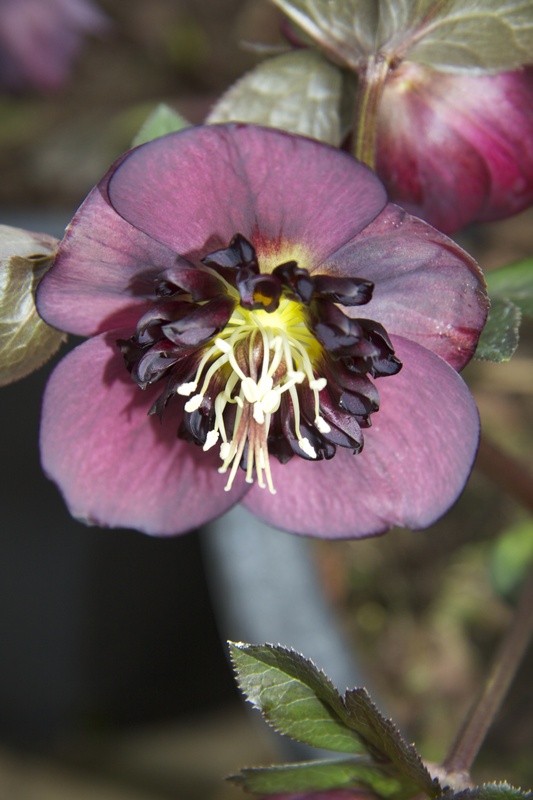 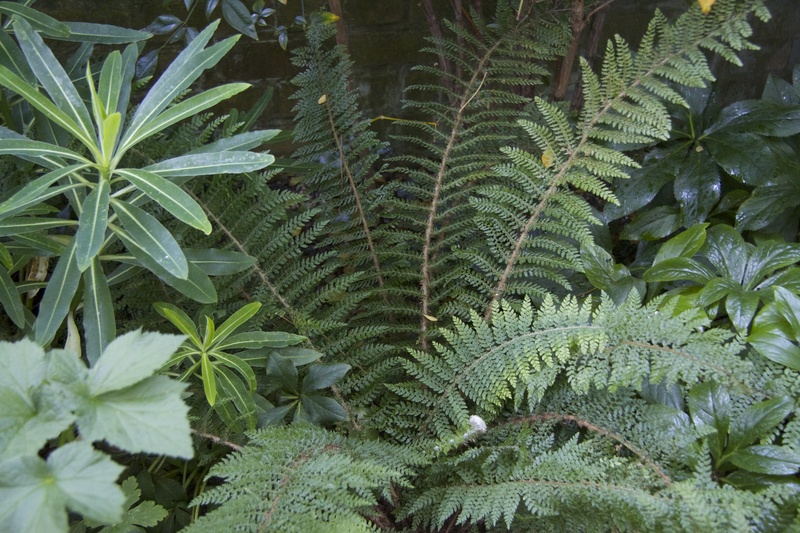 The plants he shows us are satisfyingly dense and offer a brilliant injection of colour – they are ten years old. 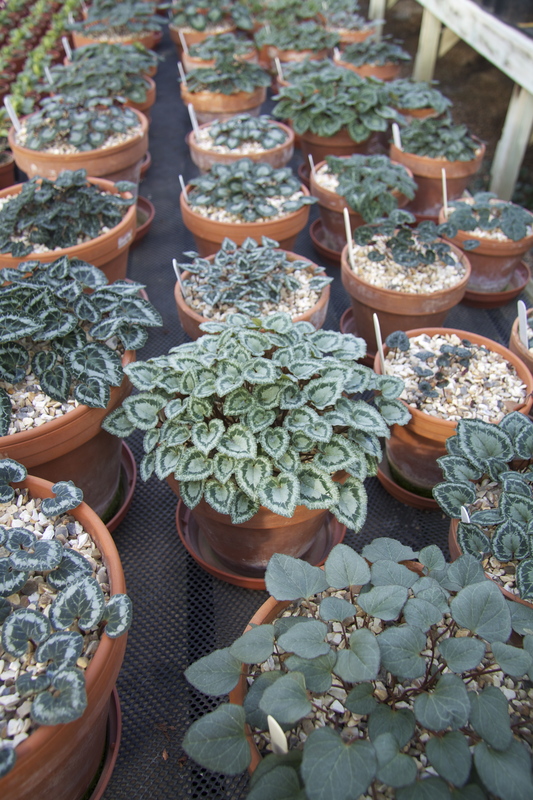 I buy a tiny pot and pledge to keep it going for at least a decade. 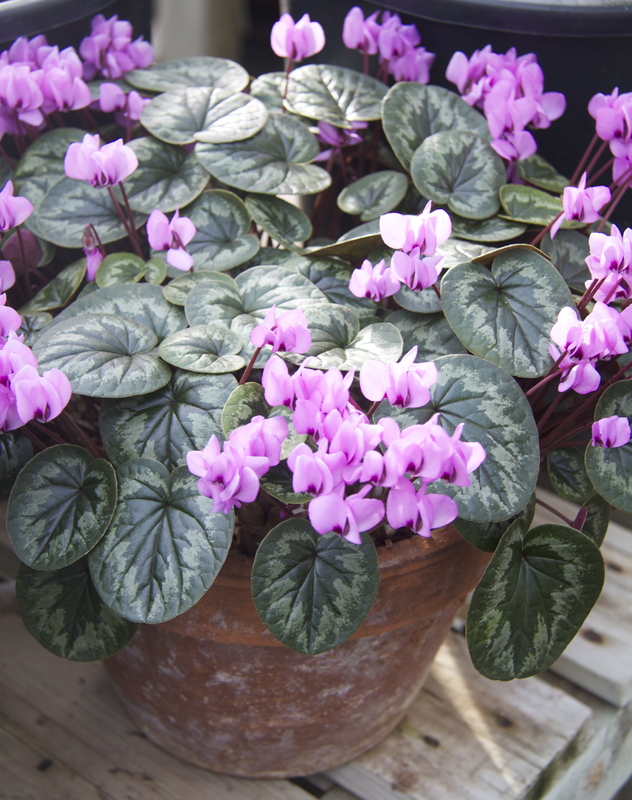 We move onto more rarified treasures such as the delicate windmill-flowered Cyclamen alpinum: Dangerously tempting, but these are jewels for a glass house or alpine house and not for outside. 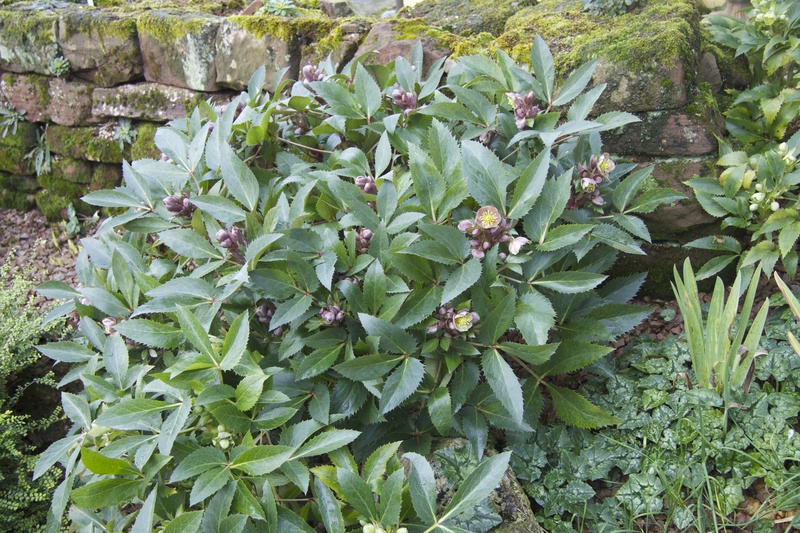 And then we are outside again and have the chance to see nursery owner, John Massey’s private garden. 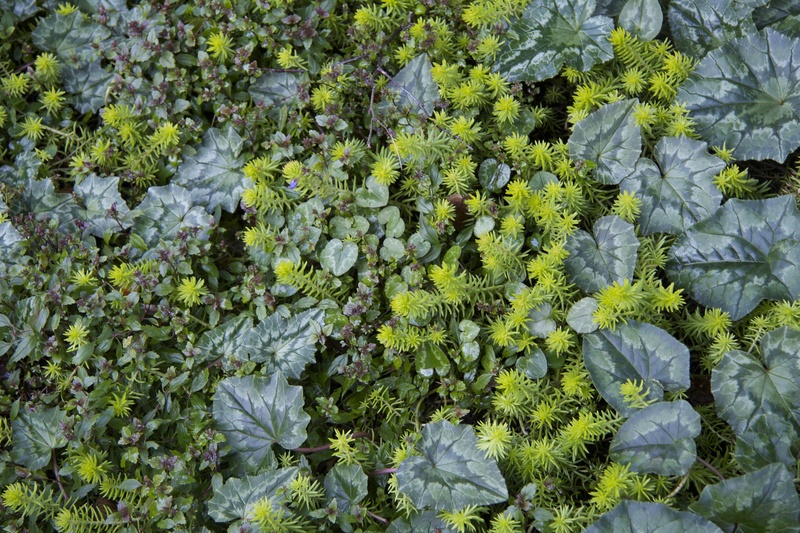 And I love the dense mat of Cyclamen hederifolium, Ajuga and the bright green Euphorbia cyparissias – fantastic persian-carpet-like ground cover under mature trees. 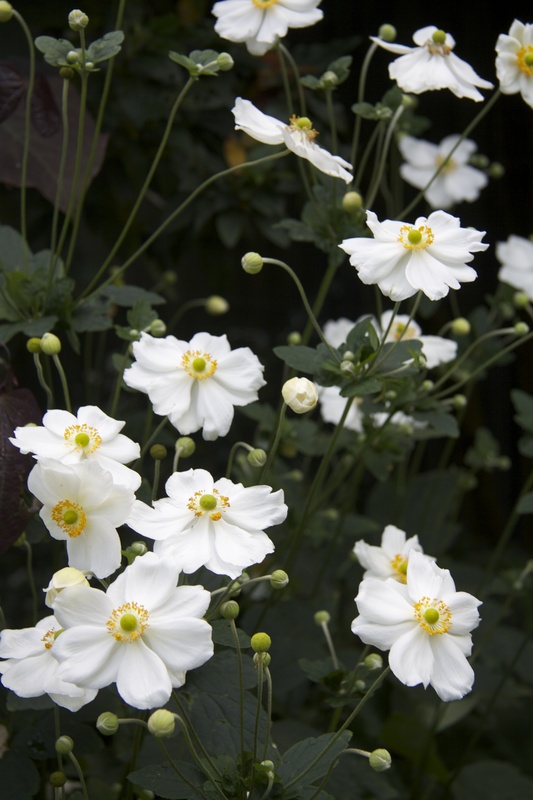 and although the day was too grim for us too find their scent they offered bursts of clear yellow and rich gold – especially effective as glimpsed in the denser planting in the private area around his house. 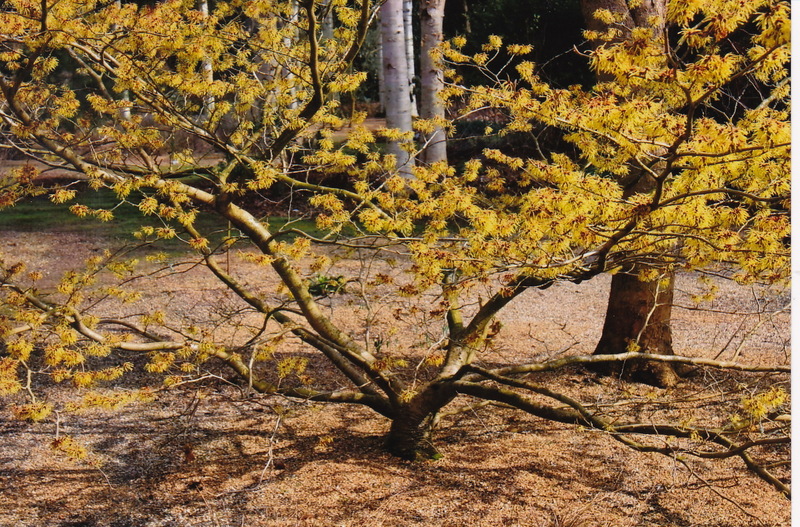 Chris Lane – who breeds Hamamelis and has the national collection gave a wonderful and inspiring talk about Hamamelis x intermedia – a talk with human passion as the clear cornerstone to the wonderful range of Witch hazel available to us today. 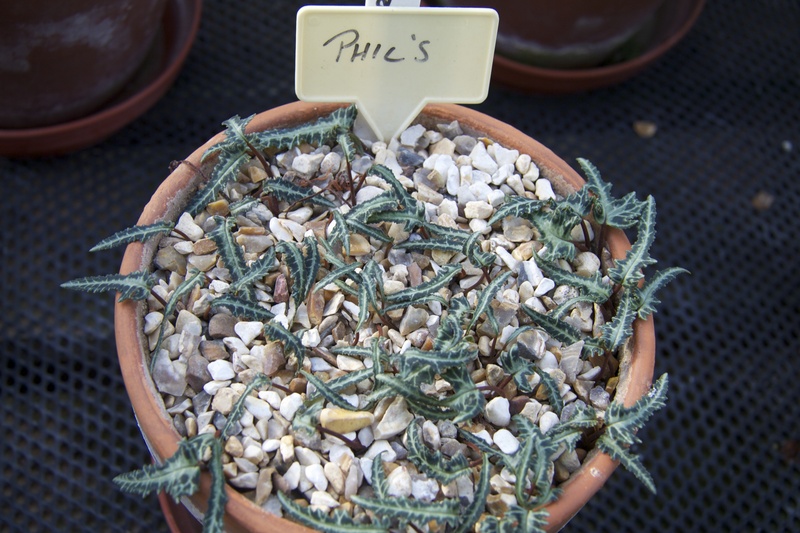 But the next day my plan to visit Chris’s nursery in Kent (www.witchhazelnursery.com) to photograph his incredible collection was just washed out by the non-stop rain. 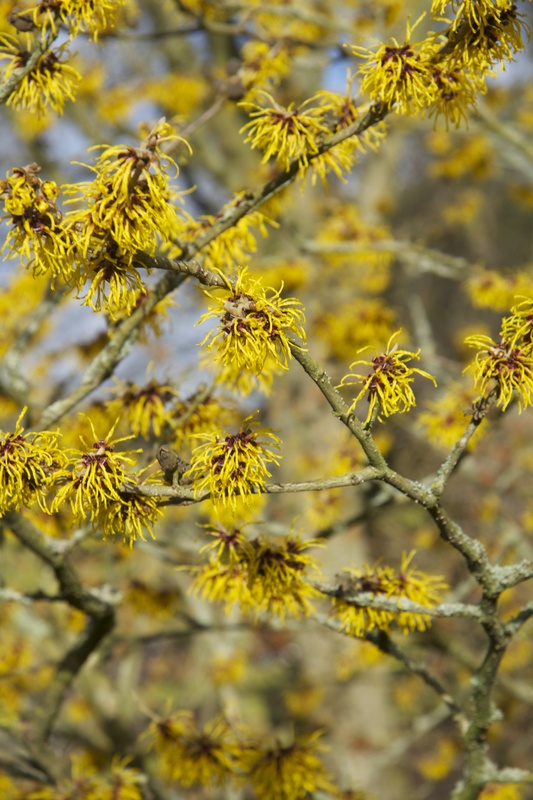 And so I have decided write about Witch hazel properly another time. 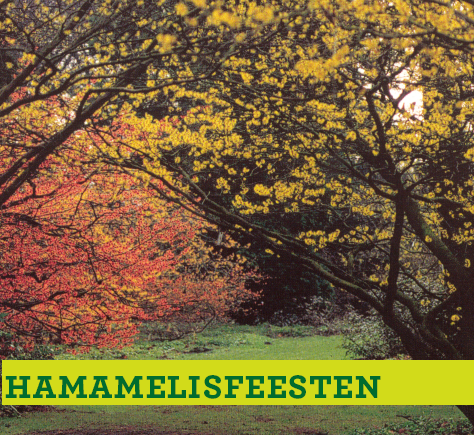 Eating away at me, however, is Chris’s dangerous suggestion that as well as fantastic mature specimens in the Savill and Valley Gardens near Windsor, the place to see Witch Hazels is the ‘Hamamelisfest’, (on until 23rd February), at the Kalmthout Arboretum near Antwerp in Belgium – the original home of many of the intermedia hybrid Hamamelis we grow today. 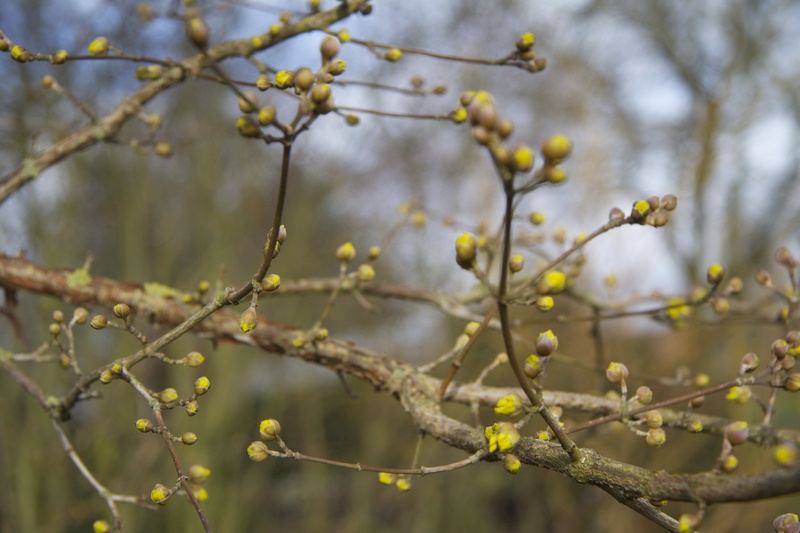 The real celebration here is seeing Witch Hazels which have become glorious spreading trees in their own right. 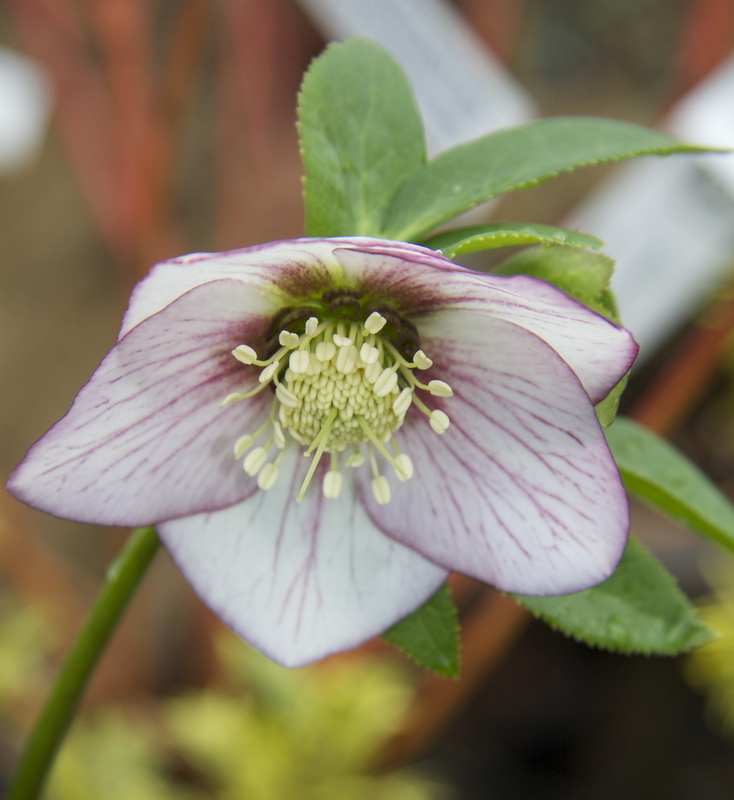 I am becoming increasingly keen on letting a good plant have the space it really needs. 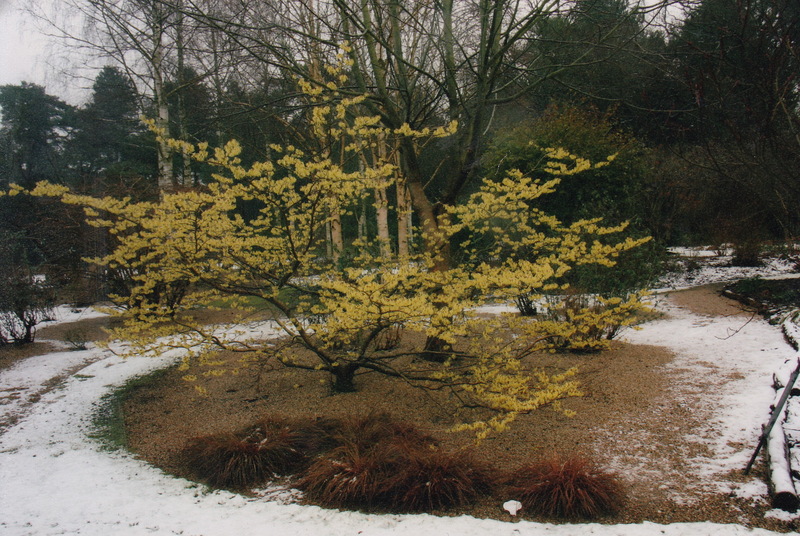 At Fullers Mill Garden in Suffolk (www.fullersmillgarden.org.uk) there is a single, prize witch hazel which lights up the woodland in winter – not least because it is has been given room to throw out its arms and be itself. 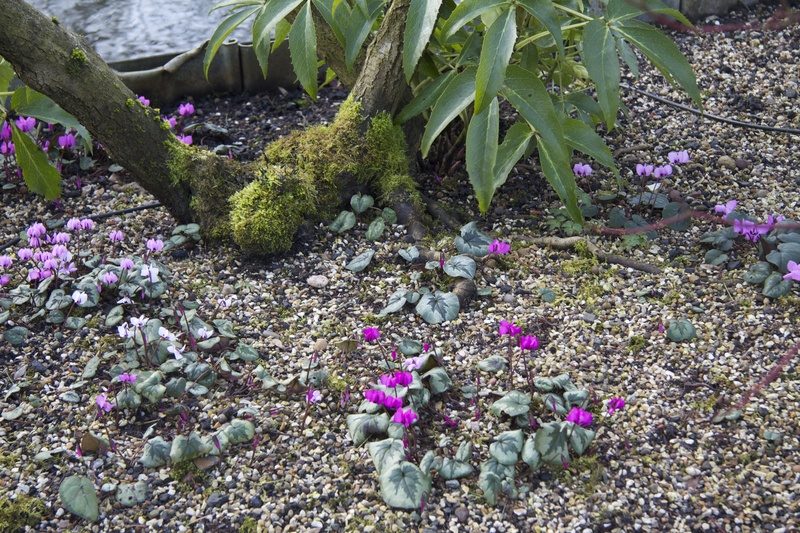 This entry was posted in Gardens and tagged 'Ashwood Garden Hybrid', Ajuga, Anemone x hybrida 'Honorine Jobert', Ashwood Nurseries, Auricula, Chris Lane, Cyclamen, Cyclamen alpinum, Cyclamen coum, Cyclamen hederifolium, Eurphorbia mellifera, Fullers Mill Garden, Hamamelisfest, Helleborus liguricus, Helleborus x sternii, John Massey, Kalmthout Arboretum, Nandina domestica, Polystichym setiferum, Savill Garden, Valley Garden, Witch Hazel Nursery on January 31, 2014 by nonmorris.